The Dorchester Stainless Steel 2 Slice Toaster boasts striking design and a full assortment of useful features, so that perfect shade of brown toast is never too far away! Showcase your style with this toaster’s striking stainless-steel body with plastic accents. Conveniently toast bread from frozen in a matter of minutes using the frozen bread function, so when your toast craving strikes, you can satisfy your urges with bread straight from the freezer to toaster. The Variable browning control allows you to find the perfect shade of brown for you. Depending on your toast style, this function gives you the control to create your perfect piece of toast. Cancel and reheat functions - to make sure you never spoil or miss out on a perfectly good slice of toast ever again. 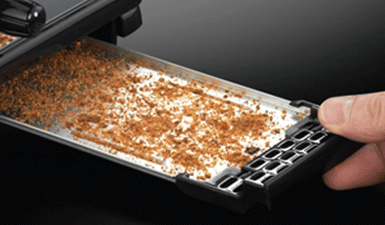 Removable crumb tray – contain your crumbs and reduce your mess! The built-in crumb tray easily slides in and out and keeps your work surfaces mess free.